Jolene Paach looks toward retirement with a great deal of anticipation, and also a little anxiety. 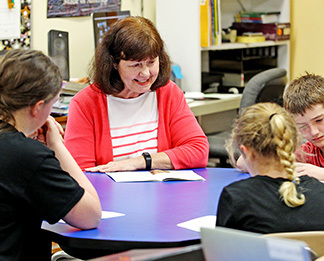 Jolene Paasch works with her fifth grade students during a reading class. She is retiring after 31 years in the North Bend school system. The 66-year-old has been teaching 34 years total, taking off 10 years when her four children were born. After graduating in 1973 from Midland Lutheran College, she taught for three years in Hooper then took her break. She taught at Cotterell School, District 93, for 12 years before consolidation sent her to the District 92 Tower School for a year, and then to town, making 31 years total in the North Bend school district. Her favorite part of teaching is watching the kids succeed. Read the full story in the print or e-edition.